Over past 58 years, Houts has worked on farm, at fairgrounds, nursery, Mail Copies, and chamber. 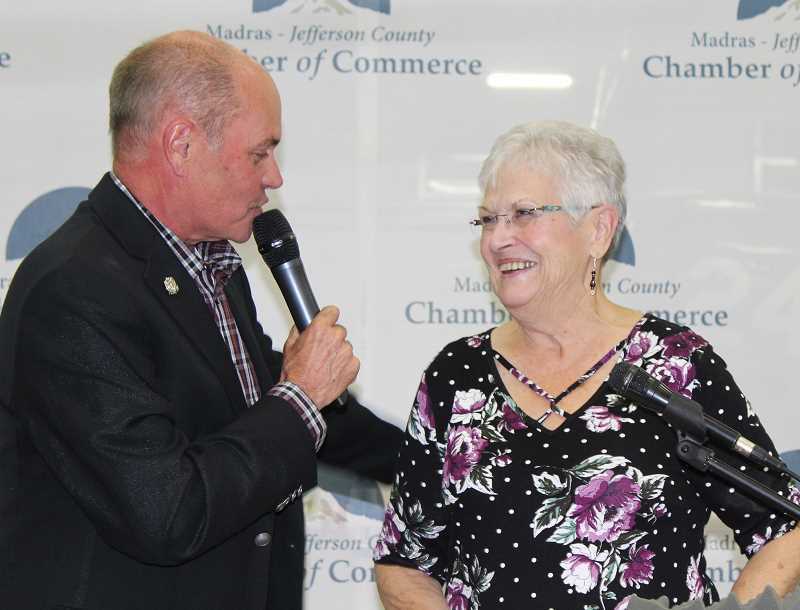 One of the most well-recognized faces around Madras, Helen Houts, was honored at the Madras-Jefferson County Chamber of Commerce Banquet Sept. 20, on the eve of her retirement. Houts, who was also celebrating her 79th birthday, received an award from Joe Krenowicz, the chamber's executive director, as an "Emeritus Chamber Ambassador" for her work as the chamber manager over the past 12 1/2 years. "I was just blown away," she said. "I knew they'd done a lot of whispering around the office. I was very flattered." Originally from Cottonwood, California, Houts was 19 years old and attending Shasta College, in Redding, and working at a radio station, when she met her future husband, Bill Houts. He was in Redding to check out the school and ended up working in Redding. After dating a while, the couple became engaged and had to determine where they were going to live. "I said, 'I'm not going back to Madras,'" said Bill Houts, who grew up in Madras, graduated from Madras High School in 1958, and then left to attend Oregon State University for a short time. Helen Houts had other ideas, so, after they were married in Redding in 1960, they moved to Madras. "We got married on a Saturday, moved to Madras on a Sunday, and I went to work on Monday," said Bill Houts, who worked with his father, Lloyd, and brother, Bob, on the family farm — Houts and Sons. "It was the best option I ever took." "When she first saw Madras, she loved it here," he said. "She was my righthand Friday." "The first year or two, I froze to death," Helen Houts said. "From that time on, I loved it." The Houtses had three children, Brad in 1961, Chanda in 1962, and Tamara in 1963, but only their youngest survives. Brad died of metastatic melanoma cancer in 2005, leaving his wife and their only grandchild, Andrew, now 21, and Chanda died in 2016 of kidney failure. Tamara Fuller, who attended the banquet, now lives in Vancouver, Washington. In the early 1980s, the Houts opened the Houts Nursery and Garden Center, which also offered landscaping assistance, which they ran for about five years. Owning a business didn't stop Helen Houts from taking on other jobs. A regular volunteer at the Jefferson County Fairgrounds, Helen Houts applied for the position of managing the fairgrounds' front office, and was hired. "I worked about 10 years there and retired there in 1993," she said. Shortly before Grandma Hoffy's Restaurant (in the building that is now Mazatlan) opened on Oct. 20, 1986, Darlene Hoffman asked Helen if she would be able to help her out on opening day. "It turned into a five-year job working as a prep cook," said Bill Houts. In 1993, Rick Allen asked Helen Houts if she'd be interested in being a junior partner at Mail Copies and More, which was first located in the Madison Coffee House building on the Culver Highway. She agreed, and worked there until she was diagnosed with a stage 4 cancer in 2001, when she stopped working, and had surgery, chemotherapy and radiation. In February 2002, she finished treatment. "We were lucky," said Bill Houts, noting that it took several years for her to regain her strength. Around the same time that Helen had started working at Mail Copies and More, the Houts bought the Meet Market Pub, which is now Wild Winds. They owned and operated the Meet Market until 2004, when they sold the business. That was the year they learned their son had cancer. "At the beginning of January 2005, she went back to Kentucky to live with Brad to help with his cancer," said Bill Houts. Their only son, Brad, died on March 5, 2005. In March 2006, the former chamber director, Parrish Van Wert, called Helen to ask if she'd be willing to work in the office for a short time. "I was supposed to fill in for Kayla DuPont (who had just had a baby)," she said. "I took the job, and after I'd been in it for a couple weeks, she decided to be a full-time mom." So Helen Houts remained for more than a dozen years. Also around 2006, the Houts were among the locals who started the community's first Saturday Market, which they participated in for four or five years. Additionally, she is a member of Relay For Life and Alpha Omicron. "Helen has been the person who is always there, keeping things organized and ready to go," said Rick Allen. "She impacted many events from fairs to festivals, sports shows to Saturday Market; it's a lifelong commitment to the community she loves and calls her home."